You can find a great American road trip along the banks of likely the most iconic river in the United States: the Mississippi River. The legend of this body of water has existed as long as the US and the mythos that surrounds it makes for a fantastic road trip. That being said, what does a Mississippi River road trip look like? Let’s lay out this road trip to let you know where to go, where to stay and what destinations and landmarks to see along the way. Let your tires run like the mighty Mississippi. There won’t be too much weaving, and interchanges along this route as your route will be guided by the Great River Road. This road was developed in 1938 and is more of a series of local and state routes that follows the meandering Mississippi from its mouth down to the Gulf of Mexico. Follow the distinct Great River Road markers to keep on your route. Now that you know about the Great River Road let’s get to the route itself. Itasca, Minnesota offers a fantastic State Park that has great amenities in a great area. One hundred sixty of the over 200 sites come with electrical and water hookups, no sewer hookup at the site but there is a central dump station. The bathrooms and showers are well maintained, and the park takes care of your other needs with a picnic and group areas. You also have a boat ramp, fishing dock, playground and more right on site. You’ll be right in the heart of the action by staying right in the park. You can check out the interactive exhibits, hike the trails, take a kayak out on the water or bike around the area. Make sure to bring your fishing pole to this area to fish Lake Itasca itself, the Mississippi headwaters and other local areas. If bodies of water are your thing, you’ll be well taken care of at Itasca State Park. Apple Valley is a suburb of the Twin Cities but is plenty close to several things to do. This public park has plenty of spacious RV sites that have full utility hookups to take care of your creature comforts and a laundry facility and bathhouses to keep everything clean. You’ll have fire pits and picnic tables for smores and a camp store to stock up on some basic supplies. Lebanon Hills Regional Campground is a great place to rest and recharge before checking out what the Twin Cities of Minneapolis and St. Paul have to offer. And there is plenty to do in the Twin Cities. If you’re outdoor-minded than you can try Minnehaha Park, Lake Harriet or the Lake of the Isles. If you feel like getting cultured, you have a few choices in the Minneapolis Institute of Art, the Mill City Museum or the Museum of Russian Art. Other points of interest include the Como Park Zoo and Conservatory, the Science Museum of Minnesota and the Minnesota History Center. There are lots of various destinations for people with varied interests in the Twin Cities. Pit Stop: Wisconsin Dells for some of the best water parks in the entire nation. We go from twin cities to quad cities at our next stop. The starting point of your Quad Cities journey begins at West Lake Park in Davenport, Iowa. This highly rated park is outfitted with plenty of amenities for RVers such as full utility hookups, dump station, hot showers, restrooms, playground, all in the middle of a lovely public park. The Quad Cities includes five cities with Davenport and Bettendorf in Iowa as well as Rock Island, Moline and East Moline in Illinois. A lot of the fun will come out of Davenport with the Vander Veer Botanical Park, Figge Art Museum and the delicious culinary creations found at Chocolate Manor. The Putnam Museum of History and Natural Science also has some great regular and seasonal exhibits to entertain both you and the kids if you’re feeling bored, head down to the riverfront to watch the passing boats and barges. This RV park is attached to Casino Queen RV Park and is outfitted like a casino resort. The sites are pull-through, outfitted with full utility hookups and also come with cable and wireless internet access. The bath houses and laundry facilities are kept clean, and the park can meet that late-night snack attack with a convenience store. This park not only offers 24/7 access to the casino itself but also has great access to nearby points of interest. St. Louis, Missouri is known as the gateway to the west and what better way to appreciate its legacy than by checking out the famous Gateway Arch, you can even take an elevator to the top of the arch! St. Louis is a big city so there will be plenty to do. If you like being outside, you can try the Missouri Botanical Garden or Forest Park. If you like stuff for the kids, you can try out the St. Louis Zoo or Grant’s Farm. Other points of interest include City Museum, the Cathedral Basilica of Saint Louis and the Missouri Civil War Museum. Pit Stop: Branson, Missouri for some casino fun, live entertainment and classic Missouri fare like barbecue. There’s always a show going on in Branson. While you may not be able to stay in Graceland itself, being a few steps away is not bad. The Graceland RV Park and Campground sites come with full utility hookups along with a choice of 30 or 50 amp electrical. The well-maintained grounds house bathhouses and laundry facilities, Wi-Fi access and a camping store. On top of all that you’ll get hiking and biking trails, a swimming pool and the whole park is patrolled by security 24/7. Considering that you’re right across the street from Graceland, you should make that your first destination. Take a walk around Elvis Presley’s famous home base and feel what it was like to be The King. After you’ve finished up at Graceland, the city is yours to explore. Soul music is the theme here so you should try places such as Sun Studio, the Memphis Rock 'n' Soul Museum or the Stax Museum of American Soul Music. At night stroll around famous Beale St. and catch some of the famous live music for yourself. A great park right on the banks of the Mississippi in Mississippi at Warfield Point Park. There are 52 sites all decked out with full utility hookups, and some sites come with their fire pits for relaxing around the fire. The bath houses are kept spick and span so no worries about shower sandals here. The park has its fun amenities like a disc golf course, horseshoe pits, volleyball court, and boat ramp if you happen to be hauling a watercraft. Between the urban stops of Memphis and New Orleans, you’ll find the beautiful river-minded community of Greenville. Taking advantage of the river’s resources is your best bet, and you can take care of this by exploring the Greenville Cypress Preserve, the Mississippi and the ancient mounds of Winterville Mounds. To mix it up you can run over to EE Bass Cultural Arts Center and if you don’t feel like being outside you can always hit up the local area casinos with Harlow’s Casino being one of the most popular in the area. River fun or casino fun in Greenville. We end the Mississippi River road trip with one of the best RV parks you will stay on your trip. French Quarter RV Resort is home to 52 large and level spaces outfitted with full utility hookups as well as cable TV. You’ll be able to take care of any end-of-trip cleanup with the park’s private bathhouses and public laundry facilities, and the entire park is monitored with 24/7 onsite security personnel. On top of these great basic amenities, you’ll also get a pool, Jacuzzi, rec room, fitness center and more. One of the best parts about staying at the French Quarter RV Resort is its proximity to the city’s attractions. You’ll be within walking distance of the famous French Quarter where you can grab a hurricane, go dancing, or check out the French Quarter’s famous street buskers. 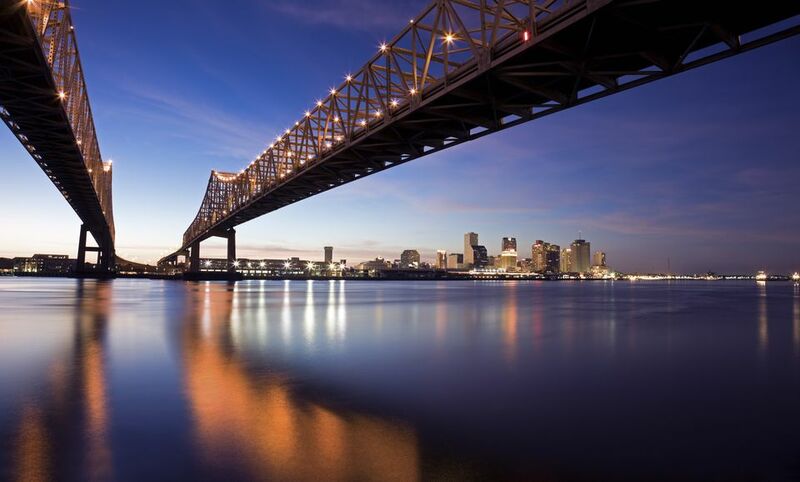 There’s more to New Orleans than the French Quarter. You have Jackson Square, New Orleans City Park, and the National World War II Museum. If you’re a bit overwhelmed with the choices, you can take part in a guided city tour. New Orleans, Louisiana is a fun town to end your road trip on. Along the Mississippi can be pretty sweltering during the summer, even in Minnesota. That’s why we recommend this trip in the early fall or late spring. You will be able to have more fun when you aren’t constantly worried about dehydration or heat stroke. We don’t recommend taking this trip in the dead of winter, or you may not be able to start your RV up in Minnesota, Wisconsin, and Iowa due to frigid temperatures.